In this article, you will learn to use two conditional statements: if and if...else to control the flow of your program's execution. Here expression is a boolean expression (returns either true or false). If the expression is evaluated to true, statements inside the code block of if is executed. If the expression is evaluated to false, statements inside the code block of if are skipped from execution. This statement is always executed. In the above program, we have initialized constant number with value 10 and the test expression number > 0 evaluates to true. Hence, the statement print("Number is positive.") inside the body of if statement is executed which outputs Number is positive. in the console.. When number is initialized with value -5, the test expression number > 0 is evaluated to false. Hence, Swift compiler skips the execution of body of if statement. 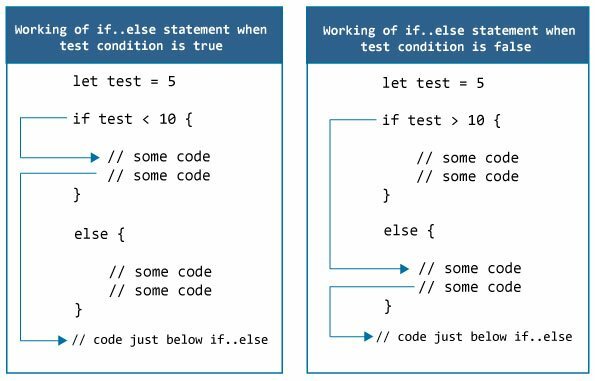 The if statement executes a certain section of code if the test expression is evaluated to true. The if statement can have optional else statement. Code inside the body of else statement are executed if the test expression is false. In the above program, constant number is initialized with value 10 and the test expression number > 0 evaluates to true. Hence,the statement print("Number is positive.") inside the body of if statement is executed. This outputs Number is positive. in the console and the statements inside the body of else are skipped from execution. When number is -5, the test expression number > 0 is evaluated to false. In this case, statements inside the body of else are executed, and statements inside the body of if are skipped from execution. You can also replace if..else statement with ternary operator in Swift, which is kind of a shorthand notation of if...else statement. The if statements are executed from the top towards the bottom. As soon as the test expression is true, codes inside the body of that if statement is executed. Then, the control of program jumps outside if-else-if ladder. The following program checks whether number is positive, negative or 0. In the above program, constant number is initialized with value 0. Since if statements are executed from top to bottom, it checks the expression number > 0 which evaluates to false. It then checks the next expression number < 0 which also evaluates to false. Hence, the statement print("Number is 0.") inside the body of else is executed which outputs Number is 0. in the console. It's possible to have if..else statements inside an if..else statement in Swift. It's called nested if...else statement. You can also replace nested if..else statement with switch in Swift which is sometimes a simpler approach when dealing with several possible options. Here's a program to find largest of 3 numbers using nested if else statements.